Now another week is soon coming to an end. This is a special week. Our last week as Regional Leaders for the Salvation Army in Latvia. When we moved to Latvia three and a half years ago the Lord gave us this verse describing our time in Latvia: "This will be the sign for you, O Hezekiah:This year you will eat what grows by itself, and the second year what springs from that. But in the third year sow and reap, plant vineyards and eat their fruit." (Is 37:30). But after the three years The Salvation Army asked us to stay some more months, and during that time the harvesting has just continued. 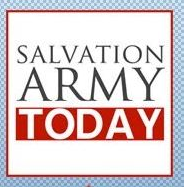 When I spoke at our farewell meeting, December 16, I asked those present who had been Salvation Army Soldiers for only one week to stand up. The new soldiers from the outpost of Sarkni stood up and they were greeted by everybody in the Hall. They had just been enrolled the week before. The first soldiers enrolment ever in Sarkani. 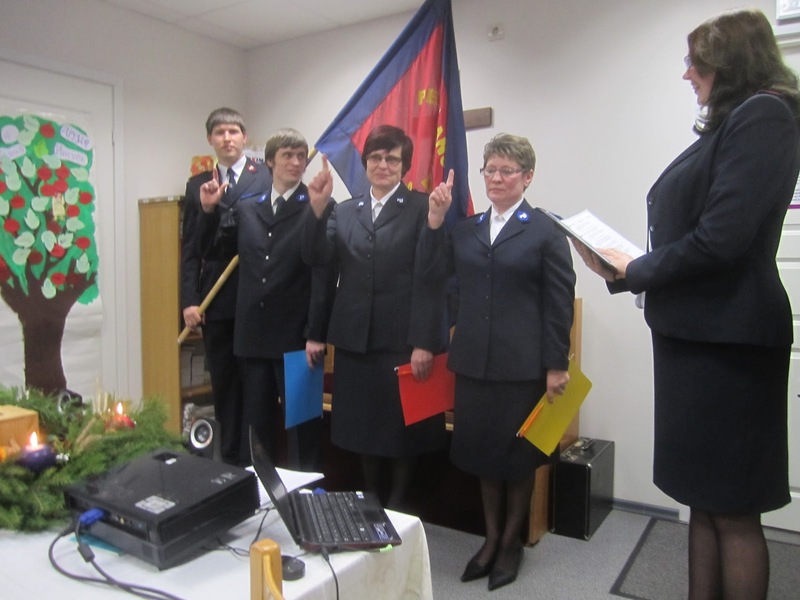 In our new Corps Planting in Saldus two recruits are now ready to be enrolled as soliers. I asked them to stand up in the meeting to be greeted by everybody in the Hall. The first soliers ever enrolled in Saldus. We thank God for everything and we pray that the harvest time will just continue in Latvia. This was probably the last "Early Sunday Morning" from the Latvian point of view, but when I became an officer, I promised to serve the Lord as long as I live, not only as long as I am an active officer. I look forward to see in what ways God wants to use us in the future. Another week. Sometimes you feel that that is to little time available for all things that must be done. This has been one of these weeks. Many hours have been occupied by sorting, saving, throwing papers at the office. You really produce some papers during three and a half years! 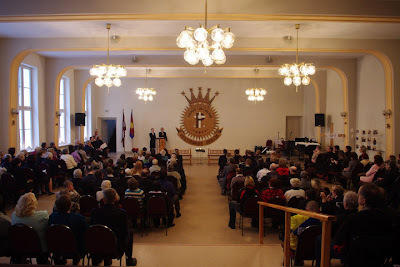 Last Sunday we had our Farewell Service in Riga. See more pictures HERE. Monday we had a Children´s dedication of two children. Tuesday we had the HQ-staff in our home for lunch, followed by the traditional, yearly bowling competition. 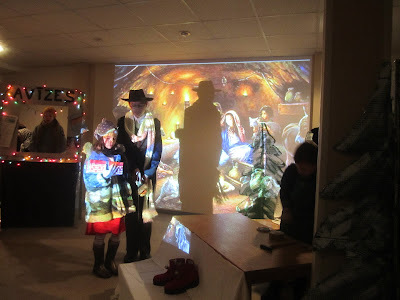 Wednesday it was a Christmas show at Patverums (=The Refuge). 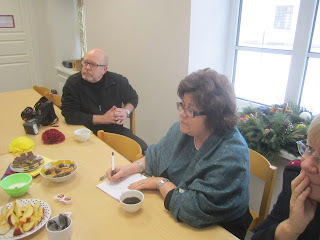 Thursday we made a visit to Iecava for a talk with the two new liuetenants leading the work at that corps. 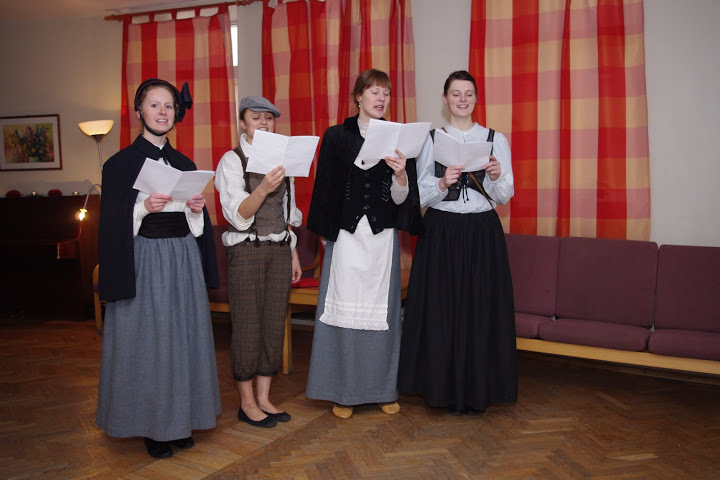 Friday we took part in the Christmas Party at the Children´s Home and Crisis Center at Skangale. But now it is soon time for a new week, and I pray that it will be a blessed week for you. Another busy week. Tuesday we hade our traditional Staff Dinner for all our staff in the Salvation Army in Latvia. Altogether we are 80 people. The theme for the dinner this year was 1865, and all the program was about the early happenings of the Salvation Army in England, with a lot of testimonies from people who met the army those days. ...and between the different performances there was time for eating and conversations. You can find more pictures from the party HERE. During the week we have also had a three day visit from two reporters from a Swedish daily newspaper, Borås Tidning. They had read about the "Change A Village"- project in rupeba.se and came to make a report of the Salvation Army work in Latvia. Yesterday evening there was a big Lucia Concert in the Lutheran Dome in Riga. The Dome was packed (1.500 persons). The archbishop had given permission to the Salvation Army to be present with the Christmas Kettle in the Dome. The Swedish Ambassadeur gave a speach informing about the work of The Salvation Army in Latvia and when the people left the Church they kept the kettle boiling. Today it is Sunday morning and it will soon be time to go down to our farewell meeting at Riga first Corps. The meeting will be conducted by Johnny and Eva Kleman, Chief Secretary and Program Secretary, from the Headquarter in Stockholm. I pray it will be a blessed week for you. The first Soldiers Enrolment in Sarkani ever! Sarkani is one of the poorest villages in Latvia, and most of the adult population are alcoholists. Now there are three new Salvation Army soldiers in the village, starting a completely new life with Jesus. Another Sunday morning in Riga. I do not know exactly how many Sunday mornings I have experienced in Riga. But the last one is coming close. 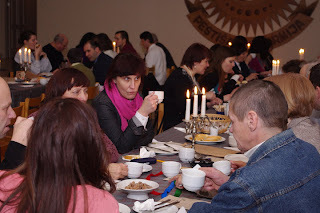 This week we had our last Leader´s gathering in Riga. A day of fellowship, prayers and sharing.. Yesterday, Saturday, was a specieal day in the village of Sarkani. The first Soldiers enrolment ever. The Children´s House was filled with people from the village and from the neighbour corps. 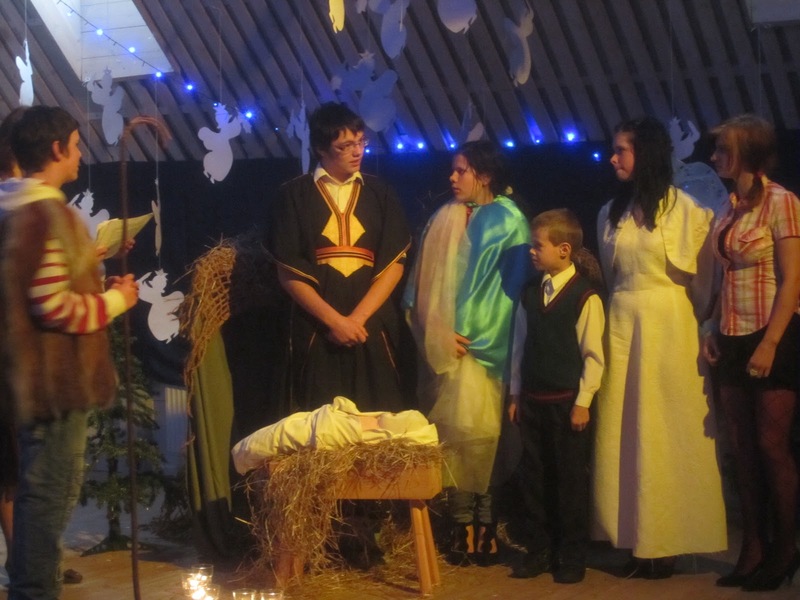 To see those well-uniformed new soldiers giving their testimonies in this poor village was a miracle! More pictures will come tomorrow. 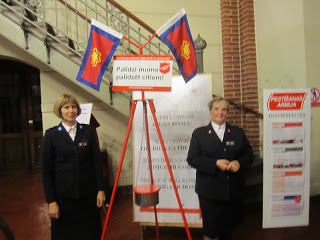 Today, Sunday, we will be out with our Christmas Kettle in Central Riga. 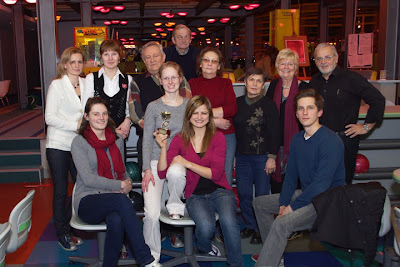 Rotary International in Riga has invited The Salvation Army to the annual Santa Fun Run event. Rotary is every year collecting money for two organisations during Santa Fun Run, and we will be one of them this year. Then - another week with our big Staff Dinner on Tuesday (70 people), another drive to Sarkani with two reporters from a Swedish newspaper on Wendesday and our farwell meeting on Sunday. Ruth´s Devotions Simple Musings for Simple Living is now available in English. The Swedish edition was printed 2008, and Sven Ljungholm has now transladed the daily devotions into English. Now there is only one month left of our living in Latvia. After three and a half years we are leaving the responsibility for the Salvation Army work in Latvia with mixed feelings. Many things we do these days, we do for the last time. Tuesday we will have the Leader´s day for the last time. We have had three different themes for the Leader´s days each semester during our time in Latvia: Salvation, Discipleship and Reaching out to suffering people around us. Our first Leader´s day the theme for that semester was Salvation. And now, our last Leader´s day will have the same theme: Salvation. God wants all men to be saved (1 Tim 2:4). And if people are not getting saved in my corps, the will of God is not happening in my corps. Then we must seek the Lord and ask Why? Next Saturday we will go to Sarkani and take part in our a soldiers enrolment in Latvia for the last time. We have seen many soldiers enrolments in Latvia during these years. Between 60 and 70 new soldiers have been enrolled. But even if this will be the last time for us, it is the first time ever that soldiers have been enrolled in the village of Sarkani. It is also the first time ever that the new leaders for Sarkani are conducting an enrolment ceremony. The first time indicates a new beginning. When you say "the first time" you expect that the first time will be followed by many other times. We hope and pray that the first time will be the start of a series of new times. But it is probably not the last time I write "Early Sunday Morning in Riga". I plan to come back next Sunday if I am still alive and if Jesus have not come back by then. rupeba is short for Ruth and Peter Baronowsky. We started this website in April 2008 to provide Christian news and teaching in a world dominated by postmodern thinking. Our approach is evangelical, based on the Lausanne declaration. We have both been working for the Salvation Army the last thirty years, mainly in the field of education. 1979-1988 we lived in Norway and worked as teachers at the Salvation Army Folk High School. 1988-2009 we were responsible for a Training Institute within the Salvation Army in Sweden. We have during these years had the privilege to travel and speak in meetings and conferences in Scandinavia and in many other parts of the world. In July 2009 we moved to Riga to be responsible for the Salvation Army work in Latvia.